BPM 0002 - Pterosaur Wing Membranes ? No Longer a "Bat Wing"
This unnamed primitive ctenochasmatid lies in a broken jumble. The radius and ulna have snapped in half. The scapula, coracoid and wing are all posterior to the tail. 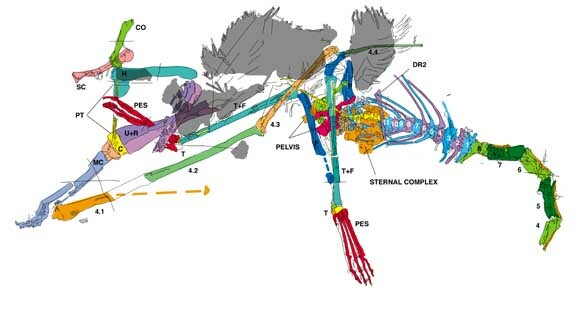 Consequently the gray areas, which represent wing membrane material, are not good evidence that the wing attached to the tibia as proposed by L� in 2002. Jun-Chang L� (2002). SOFT TISSUE IN AN EARLY CRETACEOUS PTEROSAUR FROM LIAONING PROVINCE, CHINA. Memoir of the Fukui Prefectural Dinosaur Museum 1: 19-28 �by the Fukui Prefectural Dinosaur Museum.